Trivikram’s celluloid ‘Son of Satyamurthy’ that released this summer was honoured by Apple group. 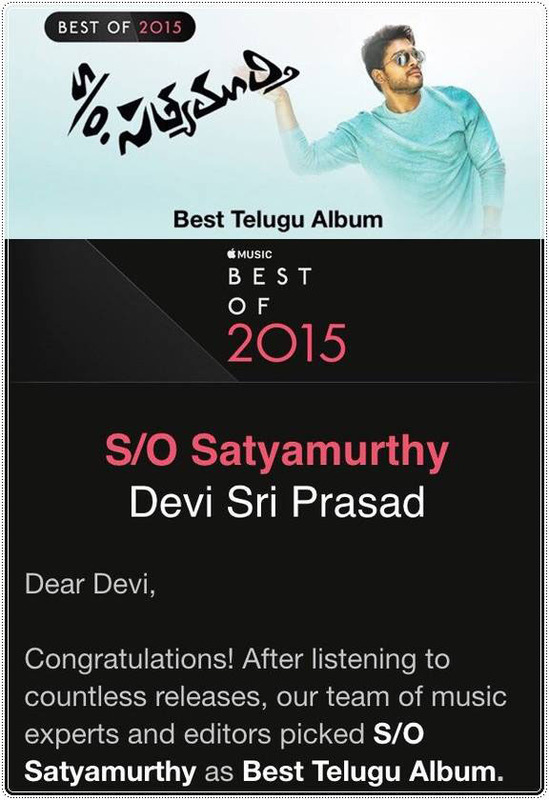 Apple that provides its users quality music with I-tunes has listed S/O Satyamurthy as the best Telugu music album in 2015. Allu Arjun, Samantha and Nithya Menon’s Son of Satyamurthy was directed by wordsmith Trivikram and is produced by S.Radha Krishna. Apple announces some of the best music albums every year. Sales, quality and people’s choice are the three different categories that Apple watches closely and ranks that particular album as the best music album on Itunes. This time, Devi Sri Prasad’s music for S/O Satyamurthy was received well in all the three categories and thereby winning the best performer award. This honour was given away under ‘Best of 2015’ conducted by Apple and Itunes.